Do you really need an(other) action figure in your life? Probably not. 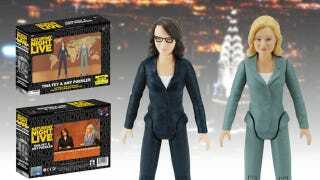 Do you need Tina Fey and Amy Poehler action figures? Probably. The toy company Bif Bang Pow!—which previously manufactured a Seth Meyers bobblehead, for whatever reason—created these Tina Fey and Amy Poehler action figures to be sold exclusively at Geek All-Star Week, aka Comic-Con, in San Diego this year. The action figure set includes a 3 3/4-inch Amy and Tina in professionally painted-on news anchor attire ready to spoof the news behind a fold-out “Weekend Update” desk diorama.